My family were always passionate about good food and I know every Italian chef says this this but it really was my grandmother who has been my biggest influence! Brixton, an area which is experimenting a gastronomic revolution over the last couple of years. Having spent 6 years working in restaurants in Spain I have now been in London for 5 years and have worked in a variety of restaurants/cuisines some of these have included: Bo London (Chinese) Chiltern Firehouse (contemporary cuisine with an American twist) and Galvin (French contemporary) as well as the Beaumont Hotel (American brasserie). 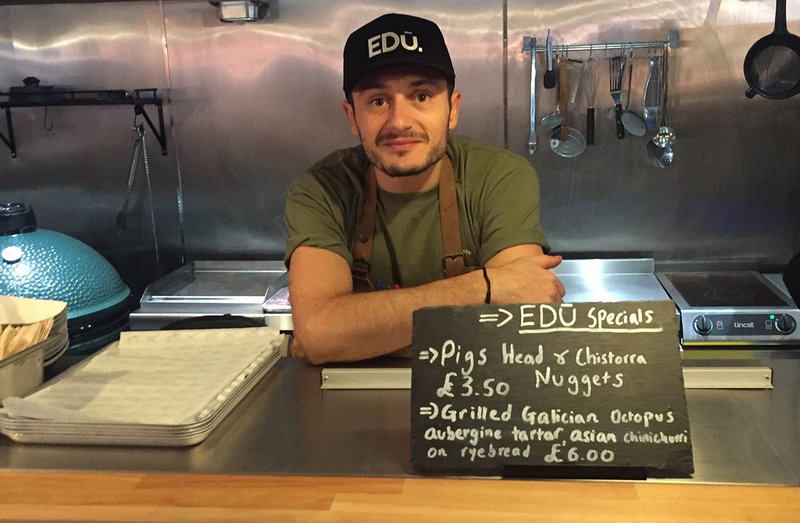 Which ingredients will sit at the heart of the EDū menu? Spanish ingredients in particular Iberico pork and Galician beef. Where will you be sourcing your ingredients from, UK or Spain? We will use seasonal Spanish produce. Will the menu remain the same or constantly changing? The menu will be constantly changing, only using products in season from the market. This will allow us to always be experimenting with new dishes. However, you will always be able to find the EDū signature dishes on the menu, signature dishes will include, the ‘cheeky dog’, Spanish pork belly baos and the EDū burger. The Green Egg seems to be a key piece of equipment in your kitchen, what will you be using it for and how did you get introduced to it? The Big Green Egg, the brain child of Alfresco Concepts, is a great piece of equipment. I started working with it at Chiltern Firehouse and I loved it. We will use it to cook almost every dish, this gives our food an extra smoky flavor. What cook books are you reading at the moment? I am currently reading the Barrafina cookbook as they are a reference for any Spanish food business in London, in addition I am also reading the Massimo Bottura cook book a god in contemporary cuisine. After a reent trip tp Copenhagen I have bought the Relae cook book a Michelin start restaurant based in that city.